August 21, 2017 – This week, our time machine heads back 100 years, to a time when surging numbers of women were demanding the right to vote. Our guest is Deborah Kops, who has written more than twenty nonfiction books for children and young adults, including her latest for ages 11 to 18. 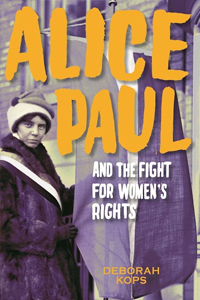 It’s Alice Paul and the Fight for Women’s Rights: From the Vote to the Equal Rights Amendment . Alice’s name may not spark recognition and appreciation in the minds of today’s Americans, but Alice Paul’s bravery and dedication — her willingness to take on policemen, presidents, and even those in her own movement — make her a person worth remembering, and one that can inspire today’s young people. Visit DeborahKops.com, or follow our guest @DeborahKops on Twitter.